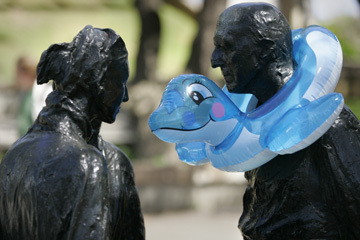 A child's swimming pool toy added an irreverent air yesterday to the unyielding visages of "Chance Meeting," the statue outside the Richardson School of Law at UH-Manoa. The placement of the inflatable baby blue sea turtle was as clear a sign as any that the spring semester is pau. A woman walked through the shadows of palm fronds yesterday on a sidewalk on the University of Hawaii-Manoa campus.